1 Bedroom Flat For Sale in Ealing for Asking Price £624,950. Stunning one bedroom apartment on the first floor of Olivier House. With a 13ft double bedroom with built in wardrobes, 17ft reception area which is open plan to a fully integrated 12ft kitchen. Luxury bathroom suite and a separate utility and storage area. Private terrace directly off the reception room. 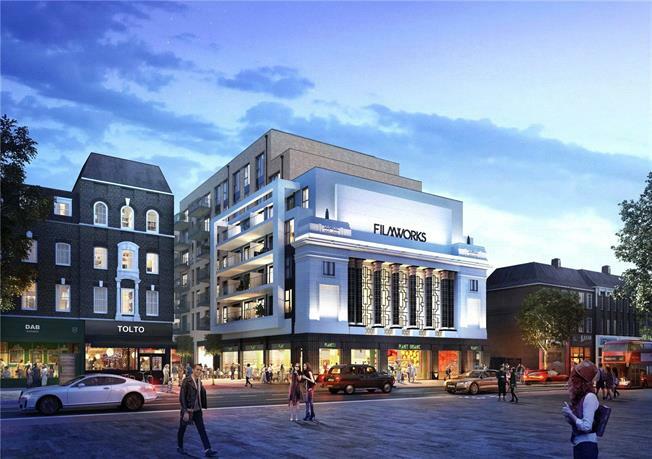 Preserving the Art Deco façade of the old Empire Cinema, this exciting new development from St George will take inspiration from the glamour and splendour of the roaring twenties. Providing over 200 contemporary homes, Filmworks will also include a spectacular new eight-screen cinema and central piazza surrounded by a high-quality mix of shops, restaurants and bars, with Vapiano and Planet Organic the first to arrive. Ealing's sense of place is about to change, at speed. The arrival of the Elizabeth Line in 2019/2020 will significantly reduce journey times: trips to Bond Street will take 11 minutes, Heathrow Airport 14 minutes and Canary Wharf 25 minutes. Ealing is renowned for its superb location and fast, convenient transport links, making it an even more desirable place to live, and an outstanding investment opportunity. Ealing Broadway station is just 500 metres from your apartment where you can access the London Underground with the Central and District Line and mainline services. Filmworks offers an adventurous mix of shops, restaurants and bars, all perfectly located around a central, open piazza. In tune with Ealing's history, the star of Filmworks will be the eight-screen Picturehouse cinema. You can find fresh and natural produce thanks to Planet Organic - the UK's largest fully certified organic supermarket, and Vapiano - offering a wonderful relaxed Italian dining experience. Enjoy the freshly prepared food before heading to the movies. Tenure: New 999-year lease from Jan 2020. Estimated Service Charge at Olivier House - £4.29 per sq ft p.a. Estimated Completion: From Q1/Q2 2021. Images are computer generated and designed to illustrate several varieties of specification and sizes within the development.